With a style that has evolved from the blues and rock, Tati, as she’s called by the public, shows her daring and modern solos with much elegance and feeling. 2016 began in a special way for Tatiana. She released her first solo album: “My Moods”. As the title shows Tatiana works and expresses the blues in its many shades and possibilities. From the animated shuffle “Blues Party” to the subtle and intimate “Sunset”, the recording brings us to an unprecedented sentimental journey. And let´s not miss to mention the exciting track: “My Dear Friend” in which Tatiana shares the solos with her friend Scott Henderson, one of the best guitar players in the world. Tati is one of the highlights of the Brazilian edition of Guitar Player Magazine. Since 2007 she has written a monthly column in the magazine, which is the most traditional publication for guitarists worldwide. She’s graduated BA in guitar in FAAM College in 2003. 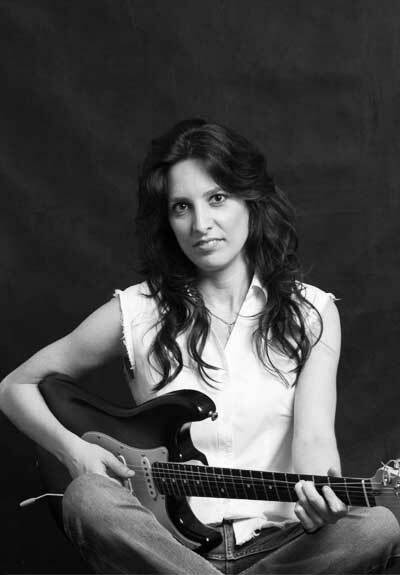 Tati teaches guitar lessons, music theory and preparatory course for the college entrance. Tatiana also works with several bands and musical projects. The highlight would be the trio Crats which was formed with Claudio Morgado (bass) and Nina Pará (drums). The result of this partnership was the record ‘Crats Way’, released in October 2013. In 2015, Tatiana was voted for the first place in the Jam Track Central contest (JTC contest), in the Blues category.